EghtesadOnline: The Swiss government is moving ahead with plans to unveil a humanitarian payment channel for Iran through complex negotiations with different parties in Iran, the US and Switzerland. The channel, which is separate from EU's Special Purpose Vehicle (renamed INSTEX), intends to stick to medical equipment, pharmaceuticals and food –goods the US says are not subject to its sanctions re-imposed after the mercurial and highly controversial President Donald Trump abandoned the Iran nuclear deal last May. 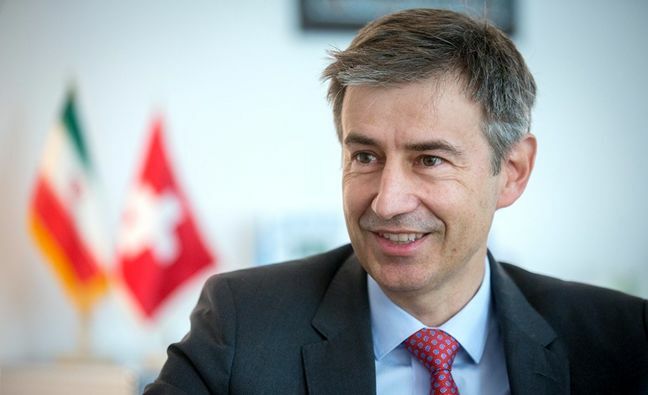 In an exclusive interview with the Financial Tribune Swiss Ambassador to Iran Markus Leitner said " good progress" has been made through multilateral talks but the channel is not operational yet. Switzerland is busy working with the Iranian authorities including the HealthMinistry, the Central Bank of Iran and the US Treasury's Office of Foreign Assets Control and the US Department of State to operationalize the channel. "We are working with Swiss companies and banks. We have to bring everybody on board and are determined to do so," Leitner said. The Tribune had been informedthat requirement for the channel, which is the transfer of funds to it, had been completed. Leitner said that is not the case despite "the very hard work" on the part of the relevant authorities in his country. The Swiss have made progress on the issueas they have earlier experience in establishing a similarmechanism during the previous round of sanctions. "We did not have to set up a new institution as was the case with the SPV where an institution had to be built from scratch," the senior diplomat said. "The focus of our engagement is the Iranian consumers and patients”, said Leitner, refusing to give a time line as to when the channel would be up and running. Bern is taking extra caution to avoid risk of abuse in distribution and supply chain so that Iranian patients or consumers do not encounter smuggled goods or products that are not fully approved by the Health Ministry in Tehran. According to the ambassador, the idea is to define an additional channel without competing with Europe's INSTEX. "This is not an SPV and it's not an additional institution; it’s an existing banking channel." Elaborating the point, he said, “Switzerland is an important supplier of these products and we want to make sure that these products are coming to Iran through this banking channel." Among banks that have been mentionedas the host of the channel is BCP. Butin a statement to the Financial Tribune, the bank denied that it had resumed any business with Iran. "No funds linked to Iran have been transferred from Japan to our bank. We have indeed suspended any new transaction related to Iran after May 8, 2018," the bank said in an emailed statement. "BCP was a bank that was used before in the previous Swiss channel and has had good relations with Iran so it's normal that name comes up," the ambassador said. He would not confirm any names of banks involved. He noted that there are banks ready to host the channel but they still "need to make sure that everybody is on board"–both Americans and Iranians. The banks have been particularly reluctant but authorities are working with the banks to "put them at ease". Another catch is that Iran needs money to fund the transactions. "There already are certain funds in some Swiss banks that have been there from the past and can be used. But we will need more money because demand is high," Leitner said without going into details. "This is not a political but a humanitarian project and is a completely transparent mechanism and something that benefits the Iranian population." Not eager to make any premature announcements, the ambassador said his country prefers to walk the talk instead of making statements." Once the channel becomes operational, we will start to ship. We want to support the banks to break their reluctance and make them feel compliant." As Leitner noted, the Swiss channel is not like the SPV and the two are separate mechanisms. "SPV tries to minimize banking transactions but ours is a direct banking channel because it is focused on humanitarian goods," he said. Asked if the channel could or would expand in the future, he said a substantial part of Swiss trade with Iran is already in humanitarian goods and no Swiss companies in this field have left Iran, some of which have 1,000 employees here. "We have very broad-based ties with Iran and I think the two countries have developed the trust in relationships over the years," he said. A sign of this is that SwitzerlandrepresentsUS interests in Iran for almost 40 years and also represents Iran in Saudi Arabia.